Our selection of fresh, handcrafted products offers something for everyone! Everyone will love welcoming home friends and family for the holidays with our beautiful wreaths. We showcase our products and highlight our programs, giving everyone a chance to see what makes us the top national Christmas Wreath Fundraiser for youth groups, nonprofits, scout troops, lions clubs, school groups, church organizations and more. The most popular size of our wreaths is 25 inches in diameter, but we have other sizes available as well. Choose from a beautiful array of festive options. This classic style Christmas wreath is as traditional as Christmas itself! 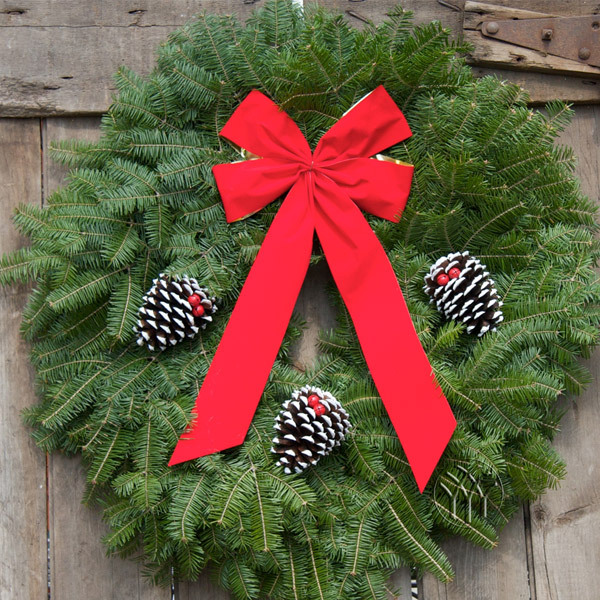 Our wreaths are all hand-made with the freshest Minnesota balsam fir. This Christmas wreath is also beautifully decorated with selected white-tipped and glittered pinecones, festively accented with jingle bells and trimmed with a gold-backed, red velvet bow. The Classic Christmas Wreath is the most popular with our fundraising program customers. *The most popular size of the Classic Christmas Wreath is the 25-inch diameter. It is also available in 28″, 36″, 48″ and 60″ diameter. The Victorian Wreath brings a taste of Old World craftsmanship to your Christmas wreath fundraiser. Handcrafted from Minnesota balsam fir, the Victorian Wreath is trimmed with an exquisite burgundy bow with imprinted wired edges. Natural bronze pine cones accented with gold jingle bells and unbreakable satin-finished Christmas bulb ornaments complete this enchanting fundraising wreath. *The most popular size of the Victorian Christmas Wreath is 25 inches in diameter and is also available in 28″ and 36″ diameter. This traditional fundraising Christmas Wreath is made from natural balsam fir boughs and is decorated with a generous 4-inch wide fabric bow with gold wired edges. The ornamental trimmings include faux cranberry sprigs and gold juniper twigs. Three natural bronze ponderosa pine cones laced with gold jingle bells set the finishing touches for this stunning addition to any and all holiday decoration themes, and is certain to be popular with your fundraising customers! *The most popular size for fundraisers for the Cranberry Splash Christmas Wreath is 25 inches. It is also available in 28″ and 36″ diameter. The distinctive look of this festive Christmas Wreath is a favorite for those that want a unique look. This wreath is made from balsam fir and decorated with natural ponderosa pine cones, a green fabric bow, and three Christmas bulb picks to give it just the right amount of ‘Holiday Cheer’! The wreath as pictured arrives fully decorated and ready to display. *Sizes are available in both 25″, 28″, and 36″ diameter wreaths. 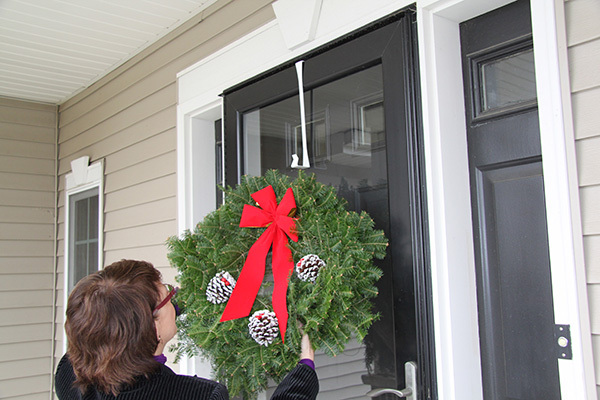 Door Sprays are approximately 26″ long and are designed to be a perfect complement to our holiday wreaths. While the Classic Spray is often used by itself, this festive spray is a marvelous match with the Classic Christmas Wreath. The glittered, white tipped pine cones are laced with festive, red jingle bells and the red, velveteen bow has a brushed gold backing – adding just the right amount of ‘twinkle’ to your Christmas wreath fundraising program! Our beautiful Victorian Sprays add a wonderful accent to any home’s holiday decorations. Trimming used on this festive spray include fresh, bronze ponderosa pine cones with gold jingle bells accented with a 3-bulb cluster Christmas ornament. The burgundy satin bow is edged with a gold print with wired edges – perfect to hold the shape of the generous 7-looped bow. Using natural balsam fir, pine and fragrant cedar boughs, the Cranberry Splash Spray is trimmed with the same elements as the Cranberry Splash Christmas Wreath. While this festive spray may be used by itself, it is often seen gracing either side of a home’s garage or entryway pillars with the matching wreath gracing the entryway door to the home. This spray is extremely popular with our Christmas wreath fundraising customers. This attractive spray matches the Wintergreen Wreath. Hand-crafted with natural Balsam Fir, Norway Pine and fragrant cedar boughs, the Wintergreen Spray is trimmed with the same elements as the Wintergreen Christmas Wreath. While this spray may be used by itself, it is often seen gracing either side of a home’s garage or entryway pillars with the matching wreath displayed on the entryway door to the home. The spirit of the holidays can be brought indoors! These Christmas fundraising evergreens make decorating easy. This seasonal centerpiece, as pictured, is bursting with naturally scented mixed evergreens which stay fresh and moist from the floral foam base. The festive decorations are certain to delight your guests and lend a joyful air to your holiday celebrations! This Table Top Tree arrives with all the trimmings pictured for fun, easy holiday decorating. This live Table Top Tree is a perfect way to decorate in children’s rooms, home entryways, office settings, elderly facilities, etc. These are nursery-grown dwarf Alberta spruce trees and may be planted outdoors after the holidays to enjoy for years to come! This large, live Christmas tree is perfect for holiday decorating in ‘small spaces’ homes and business offices. This Christmas tree arrives in a festive carton including all the decorative trimmings pictured. This nursery-grown dwarf Alberta spruce tree may be planted outdoors after the holidays to enjoy for years to come! Enhance the value of your wreaths and sprays and earn even more profit with these holiday fundraiser accessories. Add just the right amount of twinkle to your 25-inch Christmas wreaths, sprays or centerpiece with our battery operated LED light sets. The small controller/timer is easily hidden within the products’ foliage. These Christmas lights have been very successful as an ‘add-on’ sale with our Christmas Wreath Fundraising Program customers. Our custom designed EZ Hangers allow you to easily display your Christmas wreath or spray in seconds. No nails or hammers. The Christmas Wreath EZ Hanger fits on almost all doors. Can also be used for hanging towels or clothes on interior doors! Another great ‘add-on’ sale for your Christmas Wreath Fundraising Program. Our fresh Balsam Fir Garlands are hand-made and are available in both 25-foot and 50-foot lengths. These are the perfect holiday decorations for both home and commercial use on entryways, light poles, etc. Find out more about your specific group and get started today! Our goal is to help you maximize the value of the time you and your members spend raising funds to support your activities. Follow the steps for our tried and proven fundraiser, and you will be successful! Get started today.